I have a confession to make: This post does not begin in Osaka. It begins in Tokyo. If that concerns you, do not fret; I will get to Osaka soon enough. 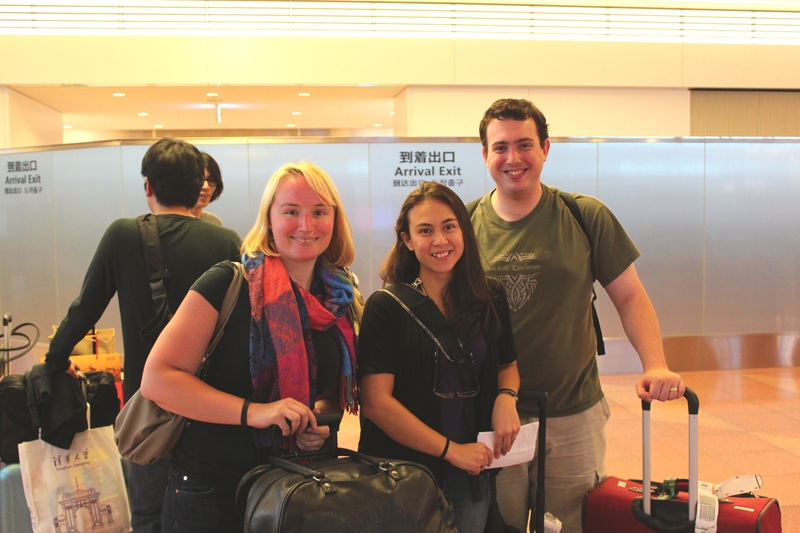 We flew in to Tokyo’s Haneda International Airport on an evening flight via Beijing. Haneda was more-or-less like every other airport that we’ve passed through these last two months. The biggest difference was that there was less English than we were had encountered in Chinese airports, which was a little surprising. 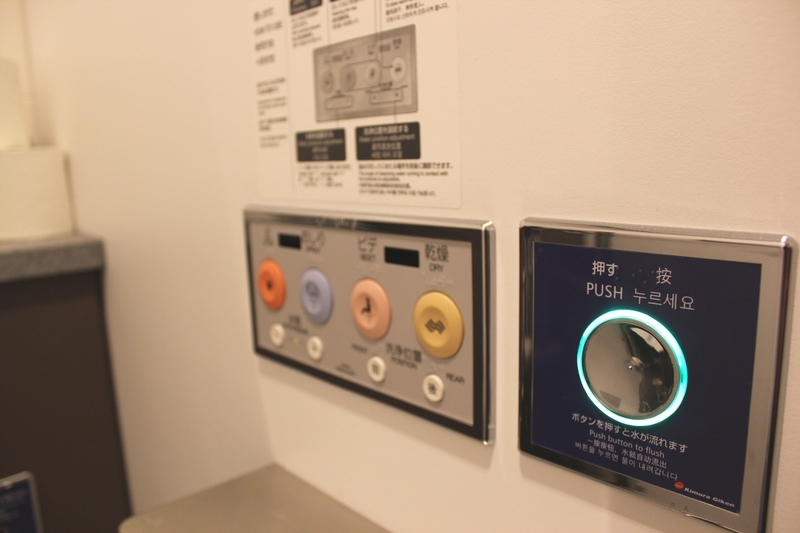 Oh, and also the airport bathrooms came with educational diagrams and required a technical degree to operate. I recommend that you study up, or you may be in for a surprise. It’s important that you know here, at the outset, that Kat had been out on a boat just a few days before, and was sporting a delightful cherry-red sunburn. 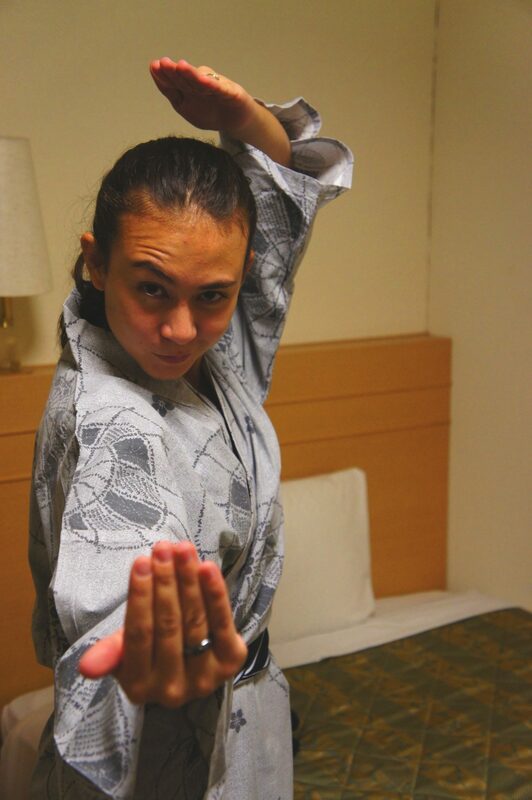 This is important because I want your experience of Japan through this blog to be as close to mine as is possible. To that end, every time I mention “Kat” I want you to envision a giant lobster doing whatever it is I am describing her doing. Believe me, I was doing the same thing. This is Kat with makeup on. She wouldn’t let me get a picture of her without it. It took us a while to figure out where to go, as the Tokyo subway rail metro system is mind-bogglingly complex. Fortunately, there was a lady stationed near the ticket kiosks who had a big “ENGLISH” button pinned to her vest. She was very helpful. We liked her. We didn’t get a photo of the nice lady, but here is an approximation. We shuffled on to the next train into the city and immediately started gawking in amazement at the Pokémon theming that adorned the exterior and interior of the train. This pretty much typifies our entire trip to Japan – rapid vacillation between confusion and amazement. I would have called it the “Pokémonorail”, personally. 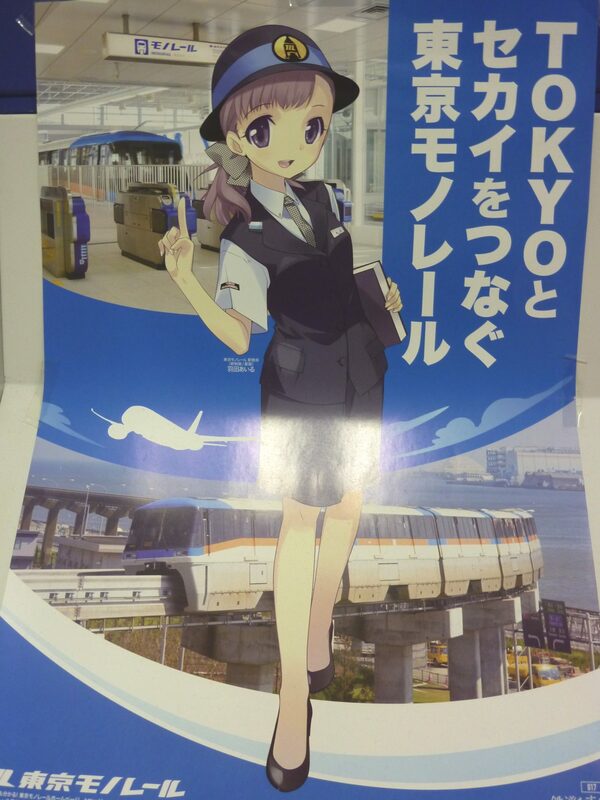 The Missus had told me that this (that is, anime-theming of trains) is something that happens in Japan. I have always secretly assumed that most of those wild “things that happen in Japan” that you read about online happened exactly twice and somebody just made a big deal about it. It turns out I was wrong. 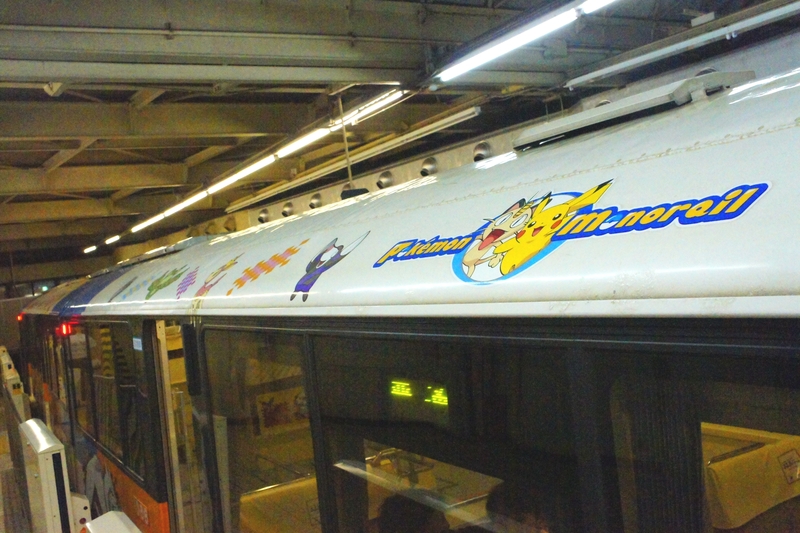 Our Pokémon-adorned train was destined for Yurakucho. Upon arriving, we again found ourselves to be completely lost. 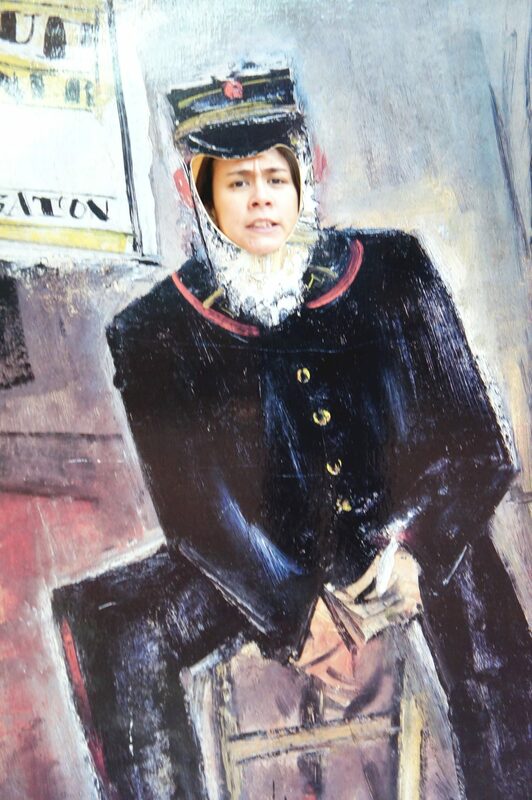 We stopped by the station master’s office for directions. We told him where we were trying to go, at which point he left his post, guided us to the appropriate station exit, carried our luggage up three flights of stairs, and pointed us in the right direction. And, before we knew it, he was gone, leaving us with no photographic evidence of our own Japanese Peter Parker. We got lost once more en route to our hotel, but we stopped a pair of Japanese gentlemen who kindly found the right route on their iPhones. They spent about 10 minutes carefully explaining how to get there (despite it being only three blocks away), and finished up by thanking us profusely for visiting Japan. We found our hotel without further incident. We had taken an evening flight into Japan, so by the time we arrived it was time to get to bed. 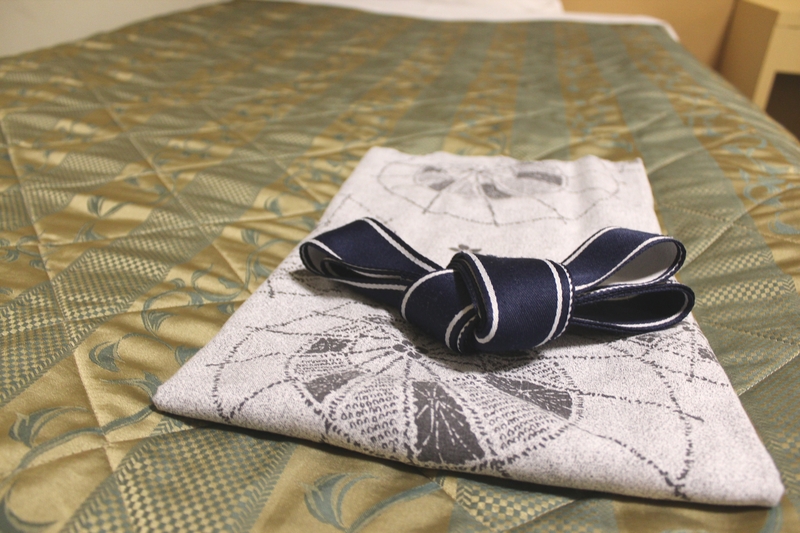 They had provided each of us with yukata, a traditional Japanese style of bedclothes. Japan has a presentation-heavy culture. We’ll be seeing more of that, trust me. 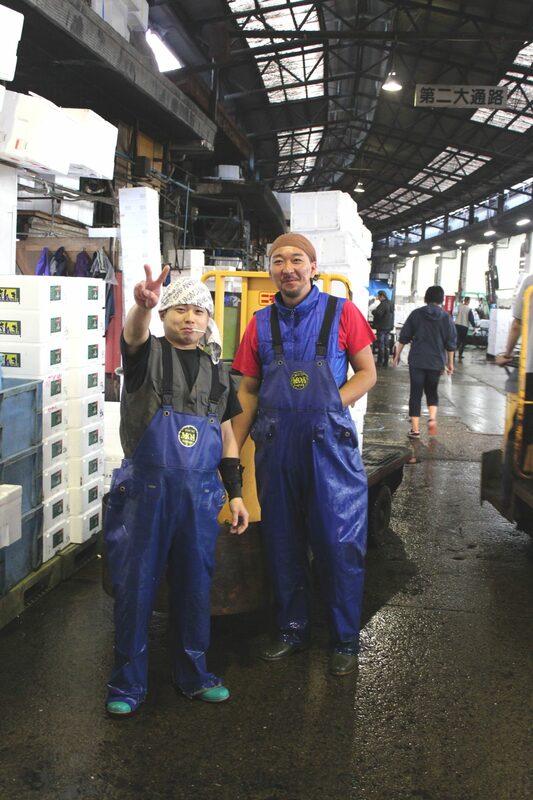 Kat (my lobster friend, recall) had her heart dead-set on visiting the Tsukiji fish market, the world’s largest fish market. She got only two hours of sleep before having to get back up and head out to catch the early-morning event. 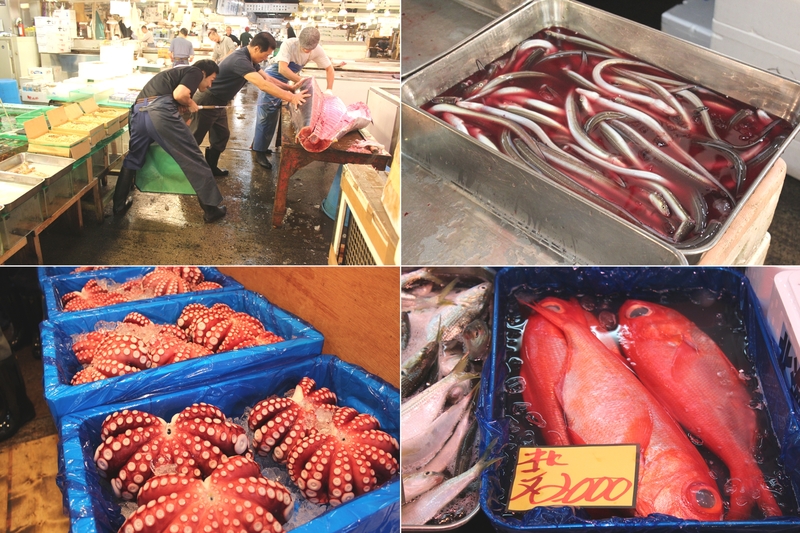 Unfortunately for her, it turns out that Tsukiji is a major tourist attraction; by the time she arrived, they were no longer admitting observers to the market. This did not prevent Kat from wandering through the surrounding area, which was packed full of fish freshly pulled from the sea. Did you know that octopus curl up into adorable seafood flowers? I did not. Kat spotted these two former plumbers (and former Italians?) working the fish market. One of the attractions of the fish market is that you can purchase sushi next door, prepared from fish that have barely left the sea. Kat, being part lobster, does not like raw fish – in my opinion, this is a cosmic injustice of the highest order. Kat tells me that the sashimi was, and I quote, “OK”. I weep at the thought. Kat returned to the hotel just in time for The Missus and I to wake up and eat our complimentary “cultural exchange” breakfast. It was mostly mediocre Western food, but it did not require us to wake up after only two hours of sleep, and by that metric it was fantastic. The three of us took the subway back to Tokyo Station, where we obtained our Japan Rail passes (Japan Rail is better known in Japan as “JR”). These passes are worth knowing about if you plan on travelling to Japan. For about the price of an average air fare you can get a pass that grants unlimited access to nearly all JR trains, including most Shinkansen bullet trains, for a week. This lets you get to most cities on Honshu (the main island in Japan) really, really fast. Having obtained our passes, we booked some seats on an upcoming train, leaving us with some time to kill in the station. 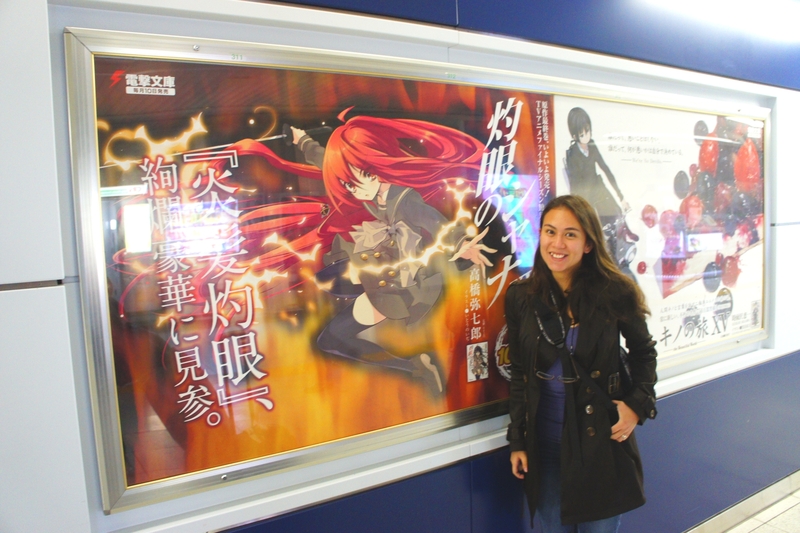 The Missus found an advertisement for her favourite anime character, the lead character from Shakugan no Shana. She was very excited. [amelia] had this face on for pretty much the whole trip. We ate some delicious gourmet bagel-sandwiches at a small restaurant in the station. We had some confusion around the tipping process; we weren’t sure whether tipping in restaurants is a thing in Japan (it hadn’t been anywhere else we’d been in Asia), which resulted in a lot of awkward hemming and hawing at the till. The language barrier did not assist us. In case you’re curious: Tipping is not customary in Japan. Anyways, the point of that story is that we missed our scheduled train by five seconds. The doors of the train literally closed in front of us. The Missus informs me that this is a very Japanese experience. Luckily, there was a very accommodating conductor nearby who put us on the next train. First class, baby. We got power outlets and e’rything. One of the beauties of the Shinkansen is that we can leave Tokyo in the late morning and arrive in Osaka in the early afternoon, about two and a half hours later. This gave us most of the day to see the city without getting delayed by airport security or waiting lounges. We arrived in the pouring rain, so we took the subway directly to our hostel without doing any sightseeing above-ground. This turned out to be surprisingly easy – the subway in Osaka is nothing like the eldritch horror that is the Tokyo metro map. 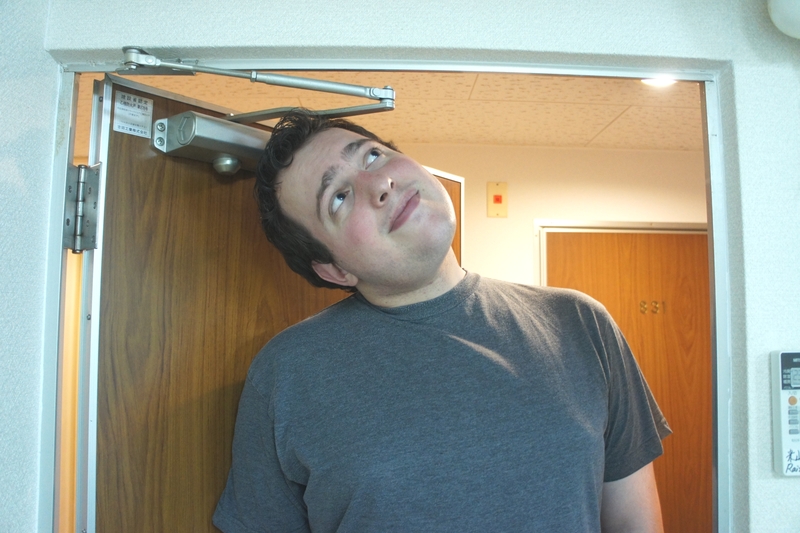 Our hostel was not constructed with 6-foot behemoths in mind. Despite our hostel’s generous selection of complimentary twenty-year-old American VHS tapes, we only stayed in briefly to plan out our time in Osaka. Then we decided to head out and see a little bit of the city. Much to my excitement, this began with food. It bears mentioning that Osaka is sort of the Paris of Japan in this respect; Osaka is famous (in Japan, at least) for its food. In particular, Osaka’s Dotonbori district is Osaka’s main draw for food and entertainment tourists, so we hopped on the subway and made a beeline for Dotonbori. 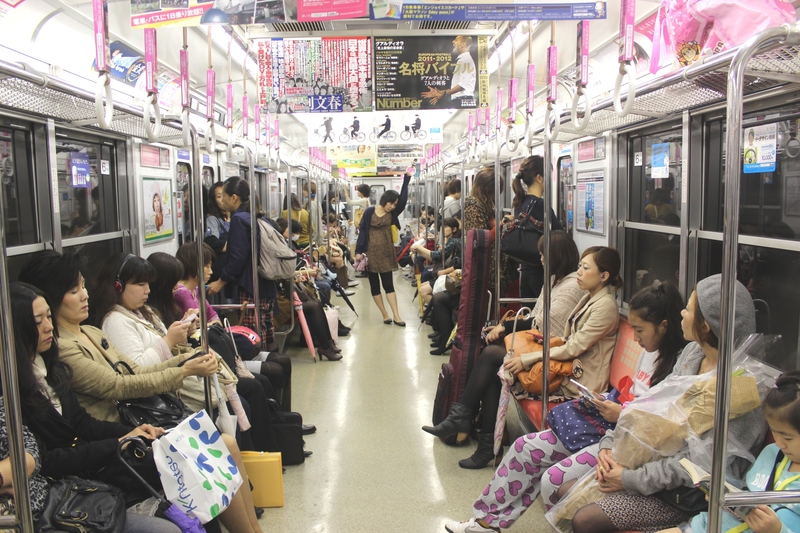 Along the way, we discovered something interesting about Japanese subways – many of them have dedicated “women’s cars”. These cars have distinctive loading areas and interior decorations (all in a brilliant, eye-catching pink), so that women who choose to use them have an area where men are obviously not permitted to loiter. These are often towards the middle of the train, so we’re not entirely clear on the etiquette regarding men walking through these cars (or loading areas, in the subway itself) to get to other cars that allow men. We saw the occasional man walk through, so we suspect that prohibition has more to so with stopping and staying than it does with simply being in that area. Kat decided to hop aboard just such a car. Apparently it is just like any other car, except pink. Since I wasn’t permitted in, The Missus (kind soul that she is) stayed with me in a mixed-gender car. I guess the subway owner heard that ladies like pink. We arrived in Dotonbori and discovered that we were surrounded by restaurants. Many of them were Big Deals in Japan. There was a crab restaurant with a gigantic, illuminated, mechanical crab above the door, a blowfish restaurant with a big inflated blowfish out front, and so on. Apparently these particular restaurants are famous within Japan for their high-class specialized cuisines, but we had just arrived in Japan and were looking for something a little more typically Japanese. We found a small restaurant that serves okonomiyaki. It’s sort of a cross between a pancake and an omelette. Its name isn’t nearly as hard to say as you might think – unlike Chinese, Japanese phonemes are pretty similar to the sounds we have in English. Now, before I offend any Japanese-language experts, I should point out that they aren’t all exactly the same as English sounds; they’re just close enough that we could usually figure out the romanized spelling of the words we heard, and could pronounce romanized words off of maps and notes well enough to be understood. So, conveniently, “okonomiyaki” sounds like “oh-ko-no-me-ya-ki”. [amelia] prefers to call it “okonomnomnomiyaki”. Whatever it sounds like, it tasted delicious. 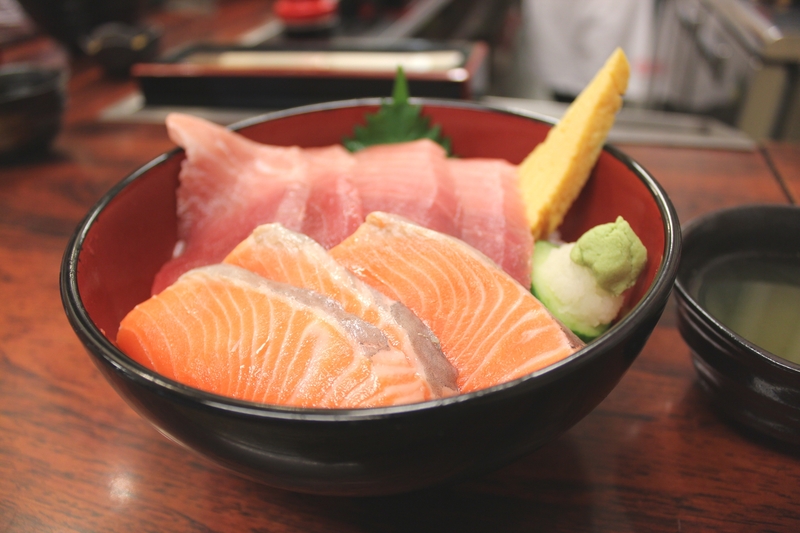 It gets grilled right in front of you on a hot plate that runs the length of the counter, teppanyaki-style. The chef throws whatever you’ve ordered into the batter; this might be shrimp, chicken, cheese, bacon, or some combination of those or similar foods. Once it’s cooked and covered in mayonnaise, sauces and toppings, you cut it with a little spade-like instrument and transfer bits to your plate to be eaten with chopsticks. We had a great time at the restaurant, which appeared to be a family establishment. Our chef seemed excited to be making us our first-ever okonomiyaki, and his wife kept making encouraging signs at us from the back of the room. Our chef was very charming. The rain had cleared, so we wandered out into the streets of Dotonbori in search of excitement. Our meal had been an early dinner, and dusk had fallen. 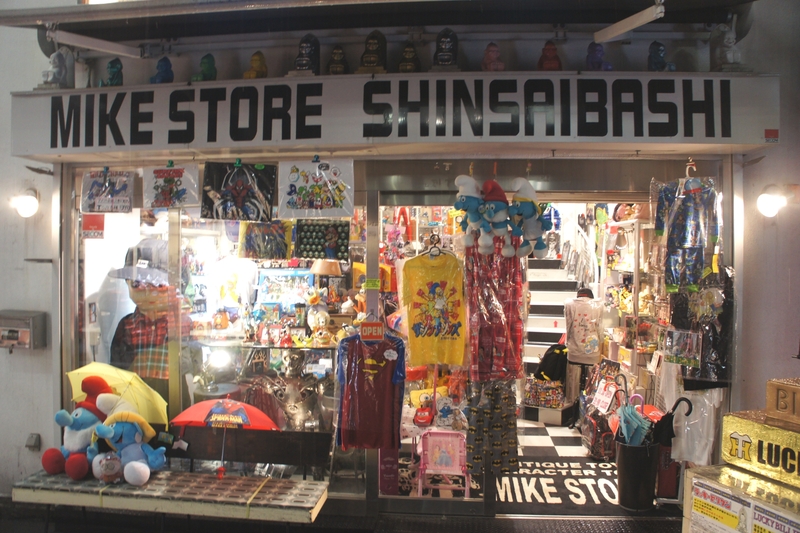 We quickly came across a collectors’ shop that was chock-full of anime figurines, cartoon character plushies, novelty T-shirts and costumes, and all manner of kitschy memorabilia. They even had a whole floor of Star Wars stuff, which (to me) seemed sort of out-of-place in a Japanese novelty shop, but it’s not like it’s my job to go around telling people whether they’re being Japanese enough. As with many stores in Japan, no photos were allowed inside. I bought the one and only non-food item that I purchased in my entire visit to Asia in that store – a pair of chopsticks modelled after Darth Vader’s lightsaber. 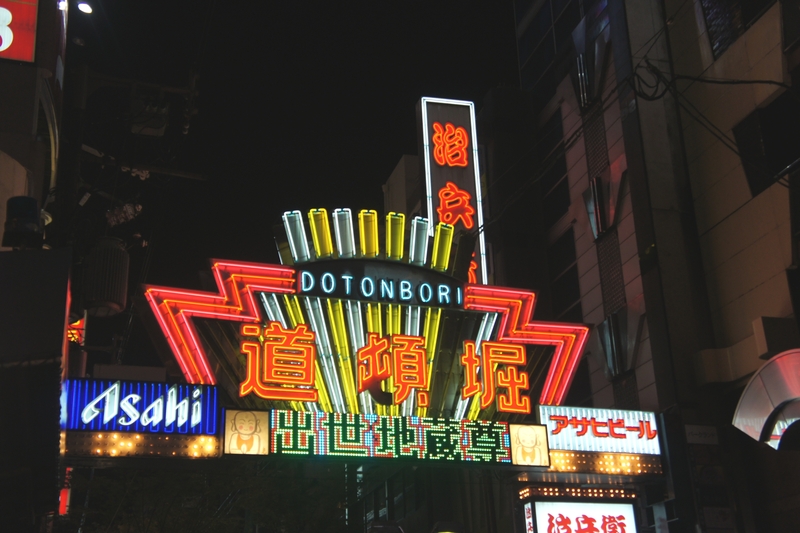 It became a Christmas gift for my Dad, but now we’re getting ahead of ourselves – there is plenty left to say about Dotonbori. Our continued journeys brought us to a large bookstore, with something like six floors laden with tomes. The Missus, being a bibliophile (that’s a fancy way to say “nerd”), immediately descended into the basement to sample the manga collection. She was not disappointed. Japan also has something called “love hotels“. These are something like a higher-class version of the no-tell motels of North America. We found a good number of them in Dotonbori. These hotels allow you to rent a room for a “rest” (a few hours) or a “stay” (overnight). Although the ladies were curious about what the rooms in such a hotel might look like – love hotels are known for their fanciful decor – the advertised rates even for short stays were high enough that we decided to continue on with our curiosity un-sated. We’re not sure how this decor is supposed to get a couple in the mood. Speaking of cost, I should point out that Japan is not a cheap country to visit. Their local currency, the yen, trades at about ¥75 to the Canadian dollar. This might lull a thoughtless traveller into spending yen like it’s going out of style. It is not. Spending yen is very much in style in Japan, and that mentality will cause one to spend quite a lot of it. It’s better to think of ¥1 as being similar to 1¢, and thinking instead in units of ¥100 (assuming that you’re used to thinking in units of $1 at home). The mathematically-inclined in my audience will likely think “hey, that’s obvious!”, but we noticed a peculiar effect while travelling through Asia. We got used to currencies with skewed conversion rates (like Hong Kong’s HK$7.5 to CA$1) typically belonging to countries where goods are cheap. Japan will break you of that particular association, since most things cost more (in absolute terms) than they do back in Canada. Hey, you don’t get all this bling for free. 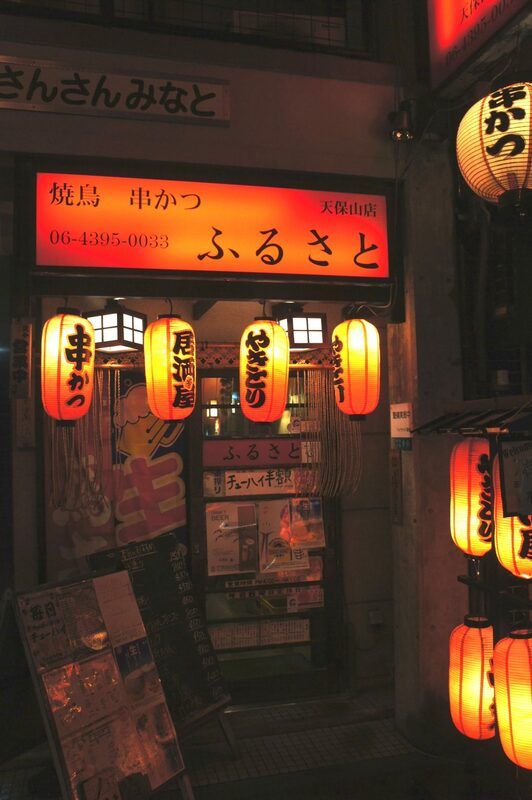 Dotonbori is also home to a number of host and hostess clubs. This is something like a bar where you pay an attractive and charismatic server (a host or hostess) to flirt with you. These clubs often advertise their existence by having servers stand outside and, well, be attractive. In the area we were in we mostly we saw hosts (males), who stood out due to their ostentatious clothing and spiky, orange-dyed hair. Regular readers of my blog know that, by this point, I have acquired a bit of a complex surrounding asking Asian people for photographs, so we did not get any photos. At any rate, these guys stood around and acted cool, not appearing to notice anyone but each other. I guess you need to go in and pay if you want to get some attention. We did not. The following morning we had breakfast at a corner store next to our hostel. Well, The Missus and I did – Kat has a rule about eating pre-packaged food. The rule is that she does not do it. It was her loss; The Missus and I had some delicious onigiri (which is like a large, triangular, inside-out sushi roll). I also bought a prepackaged local interpretation of a spaghetti meal, mostly out of morbid curiosity. Despite its use of ketchup for pasta sauce, it was surprisingly good. 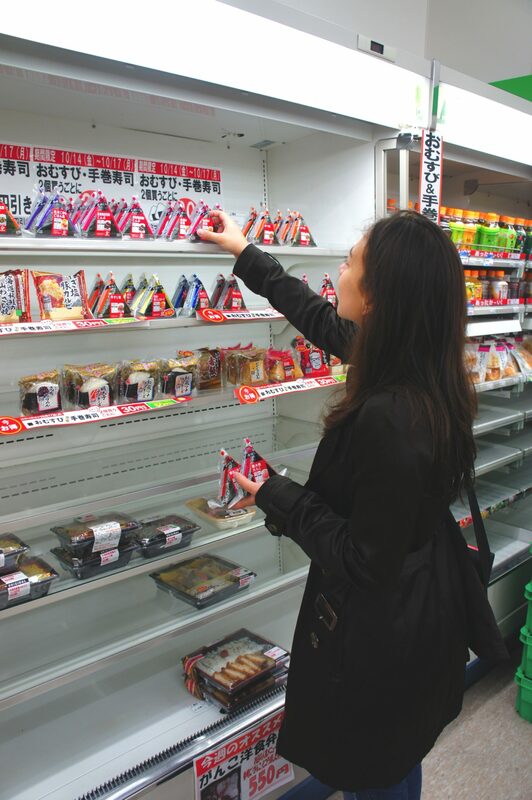 Japan has the finest convenience stores in the world. I would kill for a Family Mart by my house. We were in a hurry to see Osaka, so Kat chose to skip breakfast rather than dine on convenience store fare. We went to the nearest train station and got a one-day “Osaka Unlimited Pass”, which let us use the subway all we like and also got us discounts on tourist attractions. It wasn’t easy to find; the Station Master’s office was buried deep within the bowels of the subway complex. In true Japanese fashion, however, the staff took great care to direct us to where we had to go, which is why I am writing this now instead of forever wandering the halls of an Osaka subway station. 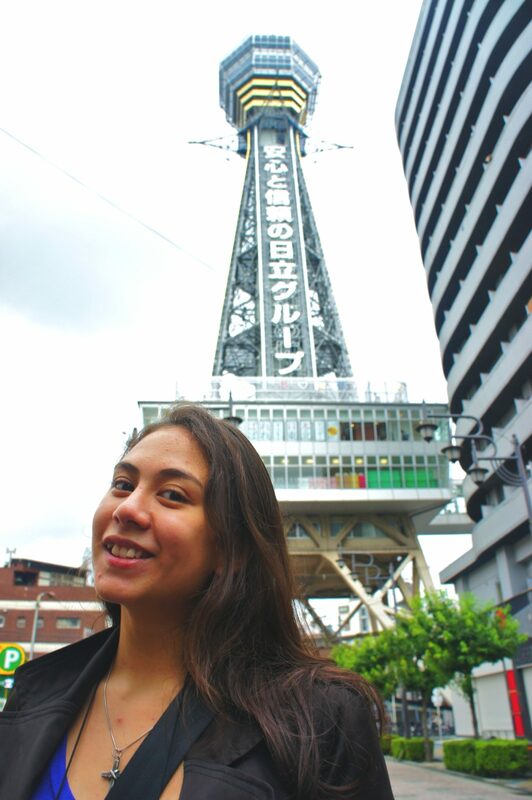 Our first stop was Osaka Tower, which is an observation tower near the middle of Osaka. It’s not actually very tall, but it doesn’t need to be. Nearly the whole city of Osaka appears to be composed of buildings with five to ten stories, which is quite different from places like Vancouver where the downtown is full of skyscrapers and the rest of the city is covered in low-rise homes and stores. Osaka does have the occasional high-rise, but the city just doesn’t exhibit the usual clustering of height. For this reason, the tower’s observation deck is only about 100m above ground, but from there one can still see most of the city. Ok, so this is more “[amelia]” than “Osaka Tower”. I happen to like my wife, all right? 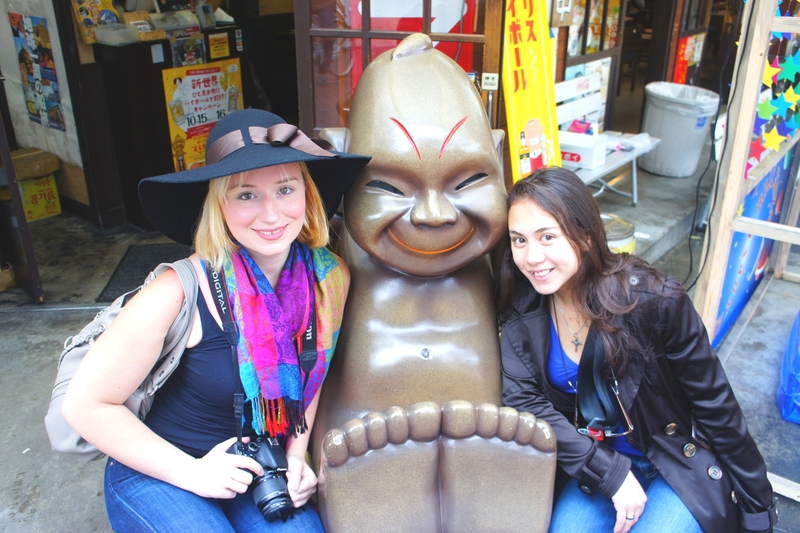 Outside the tower is where we first met Billiken, a lucky charm that is the brainchild of an American artist. 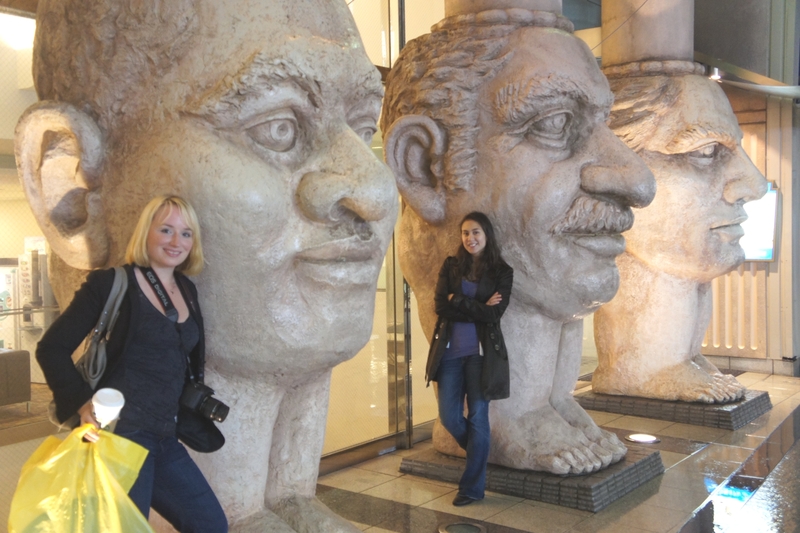 Billiken is quite popular in Osaka; his likeness can be found all over the place. Little guy’s a hit with the ladies. The tower was a bit of a tourist trap inside, but it included numerous coin-operated vending machines that dispensed anime paraphernalia (such as keychains and the like) alongside American movie posters and landscape paintings. We keep marvelling at how anime is legitimate pop culture in Japan, almost completely unlike the way animation is usually seen back in Canada. 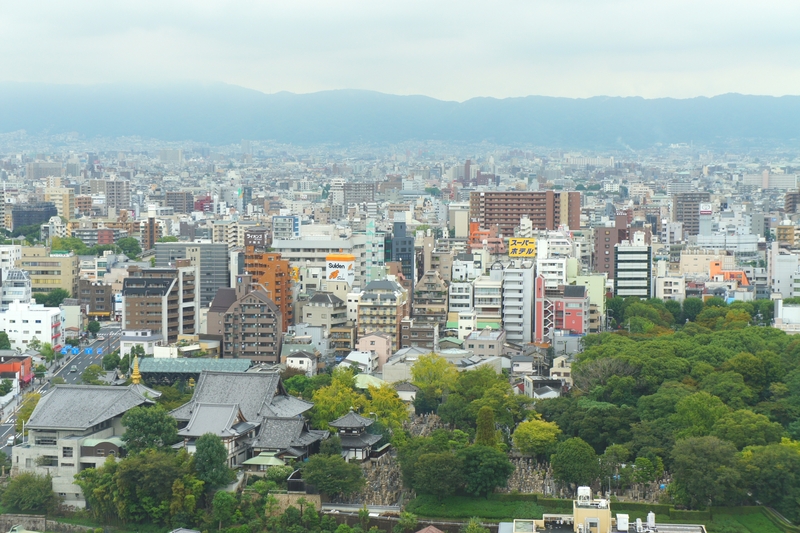 We climbed the tower (by which I mean that we used an elevator – 100m may not be that tall, but it’s enough to get me to eschew the stairs) and got our view of Osaka. It is a lovely city. Osaka, as seen from Osaka Tower. After the tower, we wandered through downtown Osaka a bit and looked for a costume for Kat. Her birthday is the day before Halloween, so getting dressed up and going to a club is a big event for her each year. Since we will be in Tokyo for Kat’s birthday, she was hoping to dress up as an anime character. We found a costume shop, but buying an anime costume is Japan is not cheap – cosplay is a pretty big deal there, and the outfits of popular characters can fetch a pretty penny (in this case, hundreds of Canadian dollars). Kat did not get her costume that day. As we wandered, we spotted a rickshaw runner waiting by his cart. Japanese rickshaws are a luxury affair (unlike in certain other countries), sort of like a horse-drawn carriage in Canada. In order to drum up business, runners don’t just stand while they wait; they jump. I suppose this reassures potential passengers that this runner has the energy to get you where you want to go. Kat wanted to visit an onsen (a traditional Japanese spa, traditionally involving a hot spring), so we went to SpaWorld, a gigantic spa complex in downtown Osaka. 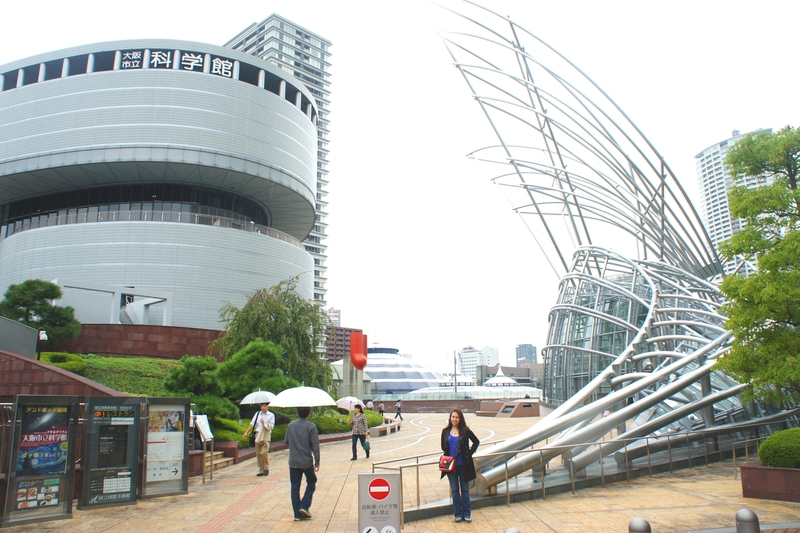 The Missus and I preferred to go to Osaka’s Science Museum, so we deposited Kat and took the subway across town. It’s actually two museums: on the left is Science, and on the right is Art. 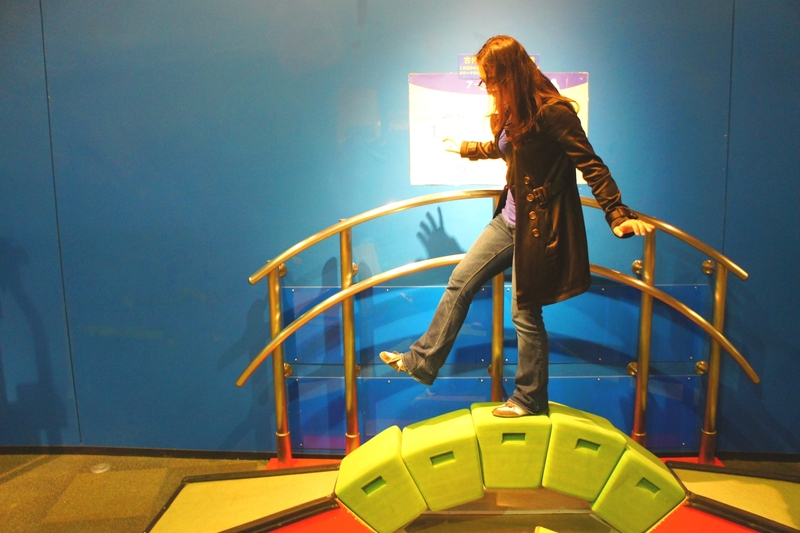 We had a grand time in the Science Museum. It was an awful lot like Science World in Vancouver, although we thought that the subject matter was a little more advanced. I’m pretty sure some of the exhibits would have been appropriate for upper-division science classes back in my high school. Being simple-minded Canadians, we stuck to the simpler exhibits. [amelia] got this globe to hang in mid-air. I’m pretty sure that makes her an applied physicist. When we were about to leave, The Missus popped into a washroom on the ground floor. This gave me a chance to observe an exhibit that consisted of turning a crank to store up electrical energy that was used to power a row of lights. Much like one of those games at a circus where you hit a button with a hammer, the number of lights that lit up indicates how much power you generated. Some little boys ahead of me were trying the machine, but with limited success – they couldn’t seem to manage more than one of the six big bulbs. I think you see where this is going. Once they were done, I cranked that thing like a madman. The big foreign dude heaving and huffing at the front of this device drew a bit of a crowd of children and their parents. When all the lights flared up, they applauded. As odd as it may sound, entertaining Japanese children in Osaka’s Science Museum may be one of my favourite memories from the trip. There are, unfortunately, no photographs; The Missus left the washroom mid-applause, and had no idea it was for me. We briefly stopped in at the Art Museum next door. It did not allow photographs, unlike the Science Museum. 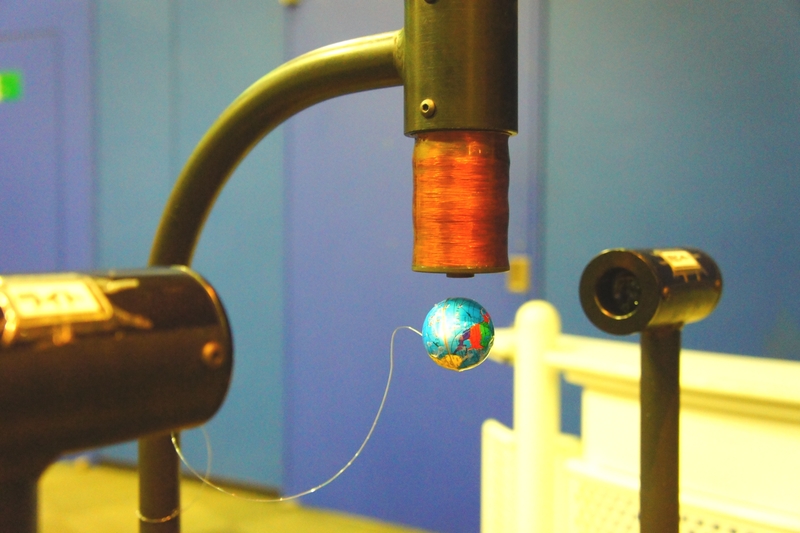 I think that difference, right there, encapsulates why I like science so much more than art. But we’re not here to talk about my prejudices – we’re here to see The Missus‘s face in amusing cardboard cutouts! We were allowed to take this photo near the entrance of the art museum, so we did. I would like to tell you what I thought of the gallery, but that will require that I trot out some of my artistic prejudices. I’ll try to be quick about it: the Osaka Art Museum is better than every Canadian art gallery that I have been to. It is not better than the Louvre. The Canadian-Louvre scale is pretty much how I evaluate all art galleries. It’s worked for me so far. On the 1-10 scale of pretentiousness (a parallel metric), the Osaka Art Museum scored about an 8, which is pretty low for an art gallery. The Missus and I returned to SpaWorld before Kat was done. The Missus was hoping to get Kat a session at the spa with some doctor fish (a kind of fish that only nibbles off dead skin cells) for her birthday, but when we explained that we wanted to buy a gift certificate or buy a session for someone else, they indicated that this was not possible. We’re guessing that there’s either a cultural difference at play or that we were simply not able to surmount the language barrier. Luckily for us, there was an informal concert outside where we could pass the time while we waited for Kat. Kat eventually emerged from the spa. She got out a little later than expected due to a lengthy massage that, due to a conversion error on Kat’s part, ended up costing a lot more in Canadian dollars than she expected. She still hasn’t admitted to me how much she spent there, as she fears my mockery. She is wise to do so. We travelled to the Umeda Sky Building (one of Osaka’s infrequent high-rises), which hosts the Floating Garden Observatory. 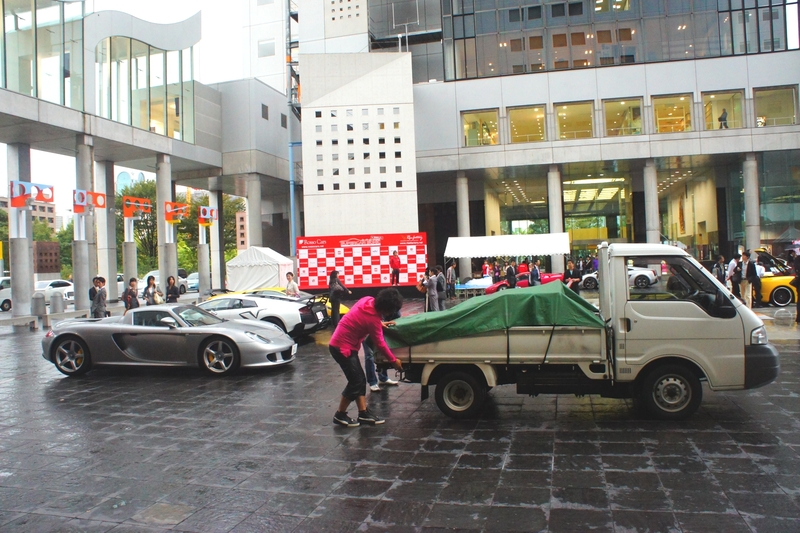 The building happened to be hosting an exotic car-show at its base. We weren’t really in Japan to see Italian cars, but we stopped briefly to admire them anyways before ascending to the top of the building. As it turns out, there were some Japanese vehicles at the show. The Floating Garden Observatory does not actually have a garden. It’s just a walkway. 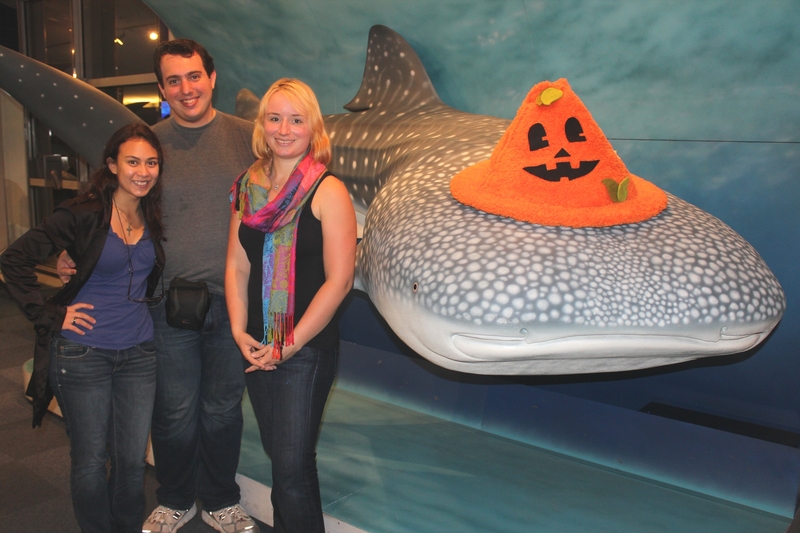 After the observatory we decided to go to Osaka Aquarium Kaiyukan, one of the largest aquariums in the world. 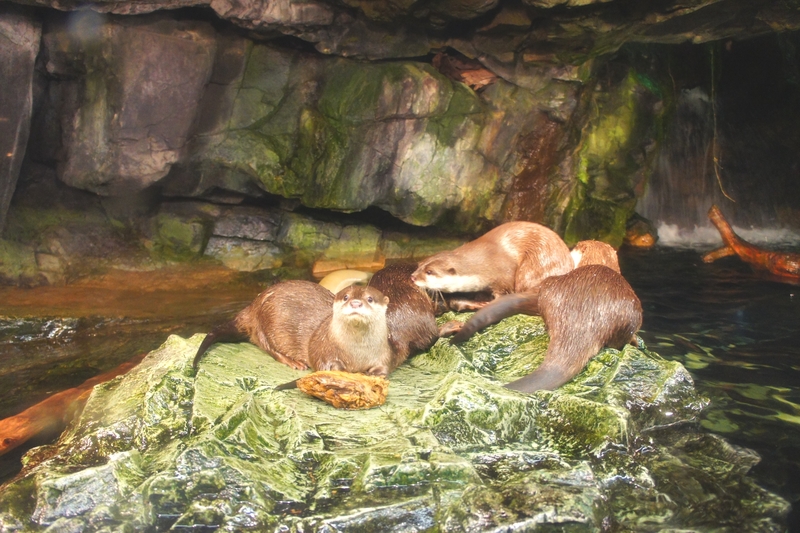 Regular readers of the blog know that we are big fans of zoos and aquariums, so this was very exciting for us. We took the subway to the port area of Osaka (called Osakako), as the aquarium has very cleverly been placed next to an awful lot of water. Along the way we grabbed a snack of takoyaki, which is basically fried balls of batter containing chunks of octopus. 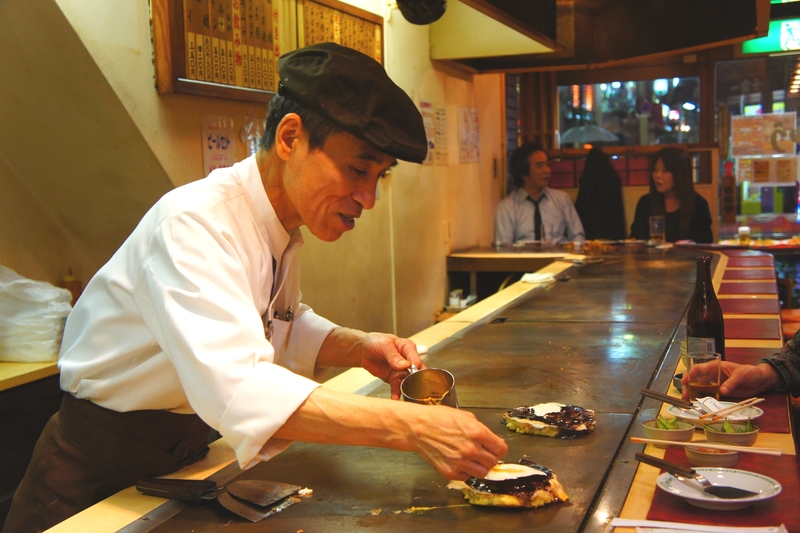 You may have noticed that both “takoyaki” and “okonomiyaki” end in –yaki; this means “grilled”. “Tako” means “octopus”. 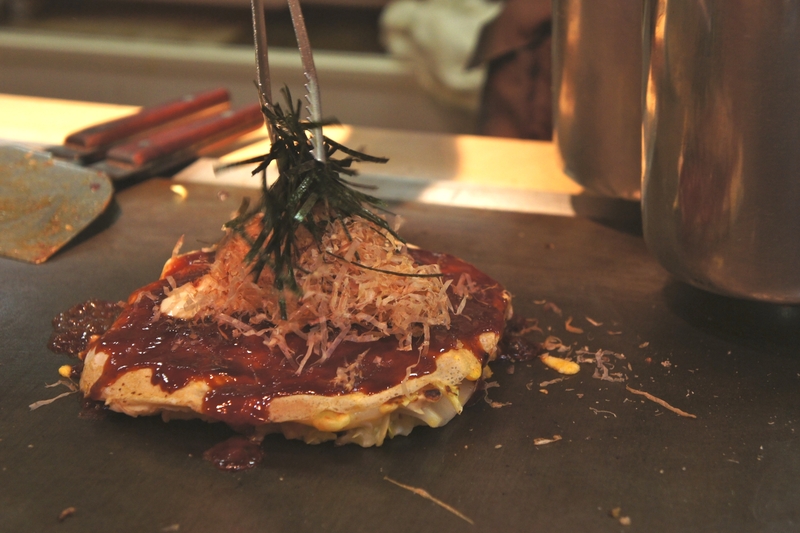 Curiously, “okonomi” does not mean “pancake”; it means something like “as you like it”, which sort of makes sense given that you can throw whatever you want into okonomiyaki. The lady who made the takoyaki taught us that “oishii” means “delicious”, which is a word that we got a lot of mileage out of (although Kat wasn’t too crazy for the octopus batter balls). You might be wondering why I’m giving this impromptu linguistics lesson. At the time, we found it very exciting that we were picking up these bits of Japanese so quickly compared to our struggles with Chinese. Travelling through China lead me to think that maybe I just wasn’t cut out for learning languages. Being in Japan wanted me to pick up a copy of Rosetta Stone; Japanese is a lovely language, and actually having a clue about what was going on was very encouraging. Anyways. 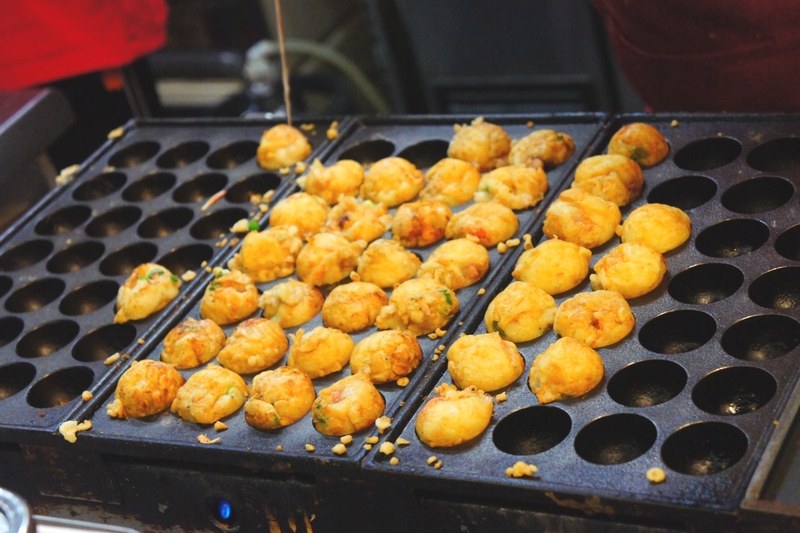 Takoyaki. We bought some. Almost as adorable as actual octopus. 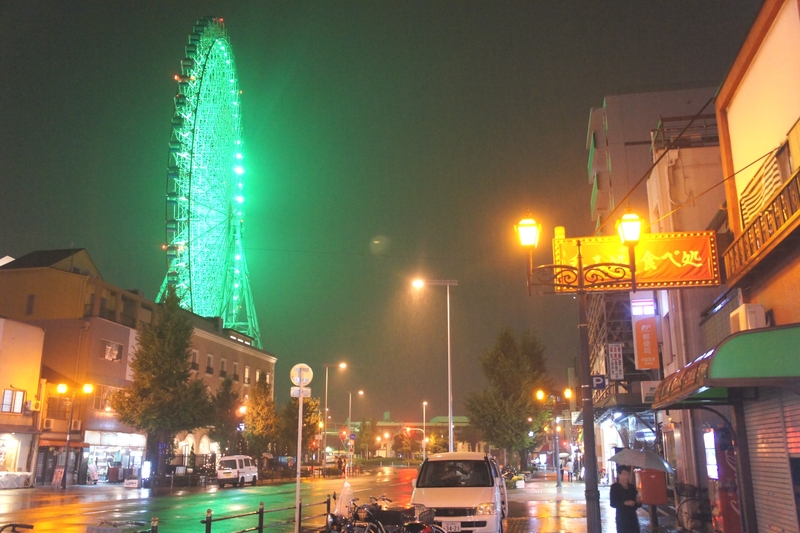 Osakako plays host to more than the aquarium; it’s also home to the Tempozan Ferris Wheel, which was the largest ferris wheel in the world until they built a bigger one in Tokyo. We spotted it while walking towards the aquarium, but didn’t hop on; the aquarium would be closing admissions for the night soon, and we didn’t want to miss it. Fun fact: The colour of the wheel is a weather forecast for the next day. Green means “cloudy”. We got in to the aquarium in time, and saw many adorable animals. Halloween is a pretty big deal in Japan. Even the sharks get into it. We’re all suckers for penguins. 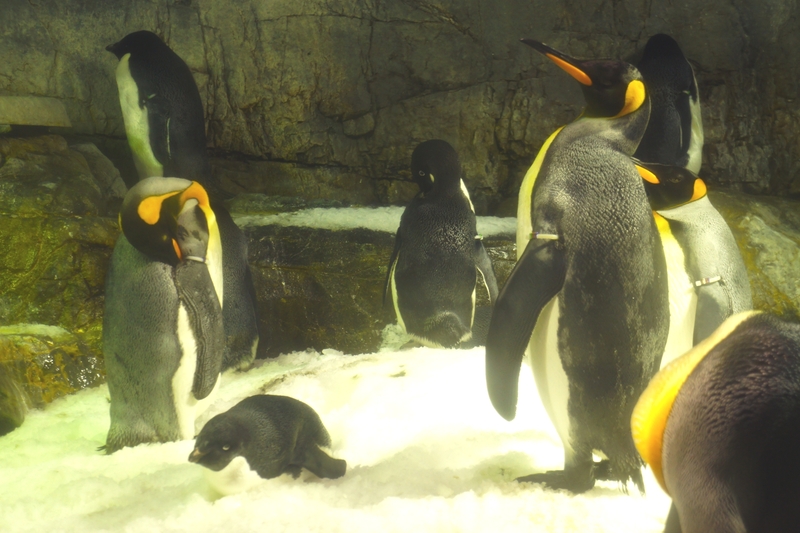 Every aquarium we go, we mostly just stare at penguins. 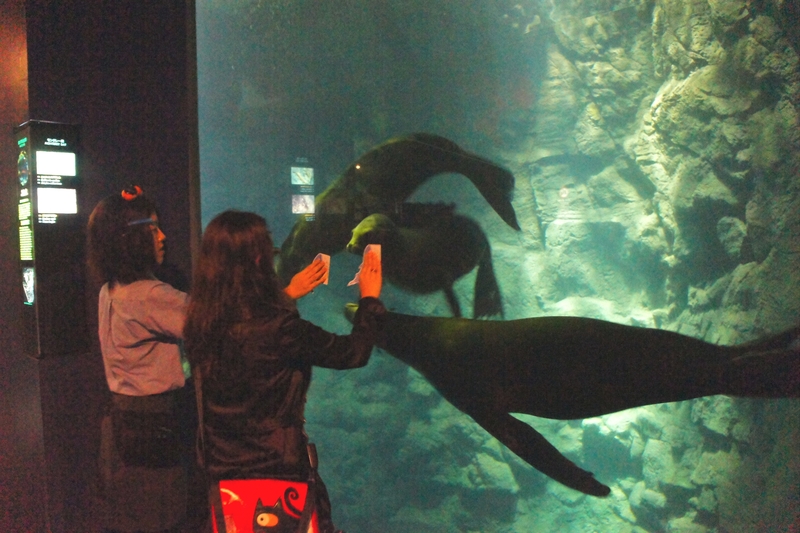 By placing a paper fish against the glass, you can get seals to love you. It’s not cruel at all. Apparently there was a shark feeding, but we had some trouble finding it. By the time Kat tracked it down, it was over. This was all right, since the aquarium was pretty great in its own right. We stayed in the aquarium until the staff gently, politely asked us to get lost. It was past dinnertime and we had yet to eat, so we filed in to a nearby restaurant. No one spoke any English in the restaurant, but luckily for us the menus featured only photographs of food and their prices; most of them didn’t even have any Japanese text. We just pointed at food that looked delicious, and it was brought out to us. 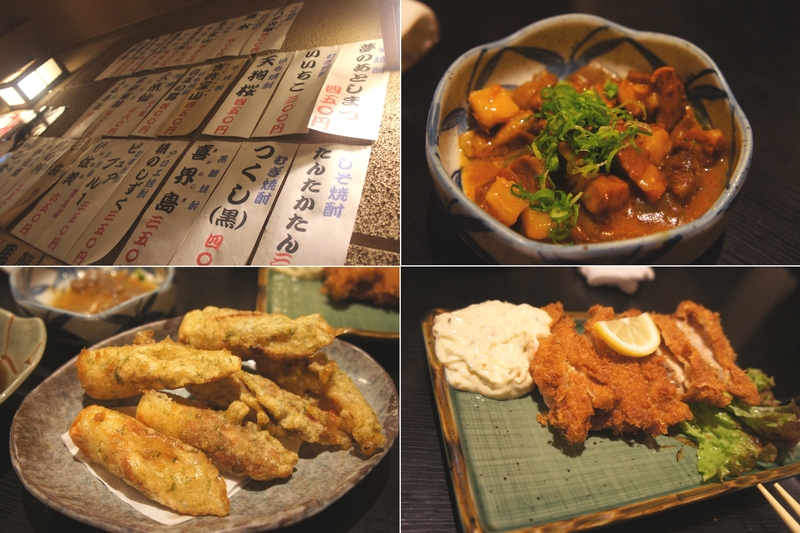 The fried chicken (bottom right) is called “yakitori”. “Tori” means “bird”. Making sense yet? As in China, restaurants often don’t assign servers to tables, and it is up to patrons to flag down servers. Being obviously foreign (and even more obviously clueless) helps, as servers seem to take a little more initiative with foreigners than might be customary in that area. This wasn’t much of a problem here, as the restaurant was small and there were only one or two other occupied tables. We finished our meal, paid the server (still being somewhat awkward about tipping, as we hadn’t sorted that out yet) and headed back to our hostel. 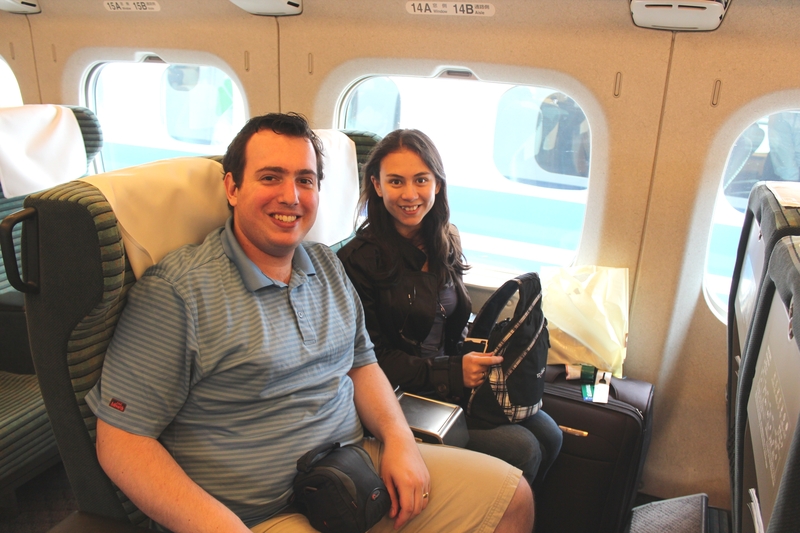 We had a day trip to Hiroshima planned for the following day, and we didn’t want to sleep in. But we’ll get to that in the next post. Go give your eyes a rest – if you’ve read all the way down to here, they’ve earned it. The next post won’t cover three distinct days, so it will be much shorter. 13 January 2012 11 February 2018 Christopher ScottComments are off for this post.